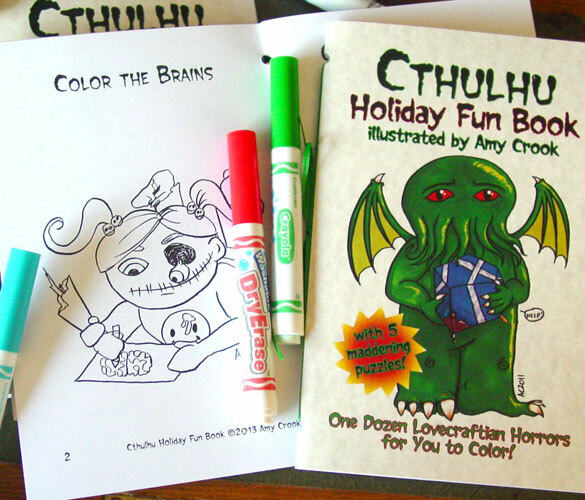 I’ve finally finished my Cthulhu Holiday Fun Book, a handmade coloring and activity book themed around holidays from Halloween to Father’s Day (zombie style). 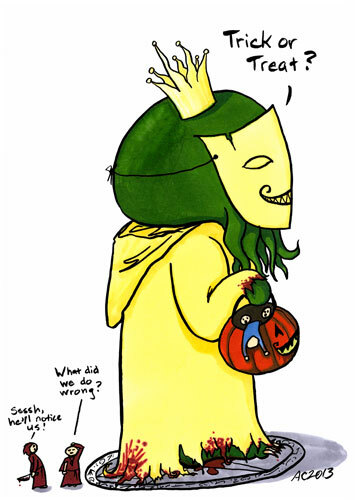 The above art is lovingly dedicated to Goomi’s Unspeakable Vault, my favorite Cthulhu webcomic of all, since he had the idea of dressing Cthulhu up for Halloween and did it much more cleverly than I. 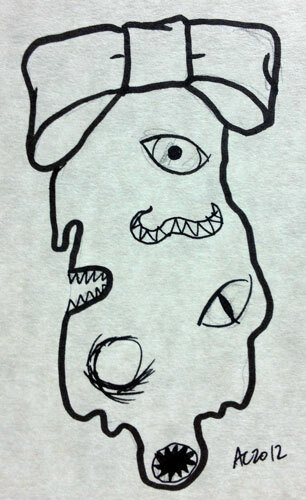 This image and 11 more are waiting in the book for you to color, along with 5 original maddening puzzles and activities. I don’t promise some of them won’t drive you insane, but hopefully you’ll enjoy the journey. Get a copy at my Etsy shop today! Another busy week, whew! Monday I did a long-overdue sequel to Growth, and Tuesday I finished an actual painting on canvas. Wednesday I updated you on the State of the Artist. 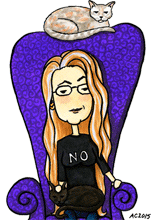 Thursday another Uncanny Fear came out to haunt us, and Friday I switched gears with some silly clip art dingbats. Saturday John was grateful, if a bit reluctantly. 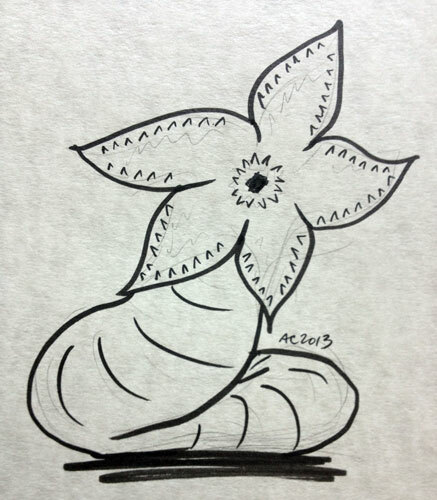 For today’s sketch, we have someone’s weird coloring book addition, and one of the Lovecraft Mythos critters that kicked our butts one of the last times we played Arkham Horror, Shudde M’el. He’s kind of like a sandworm that just sits on you until you die. I wasn’t feeling all that well last week, so this was a quiet week for posting art. Wednesday we met a whole bunch of monsters and Friday we saw some of their very specific brethren. Then Saturday we went birdwatching and I showed you a heron. 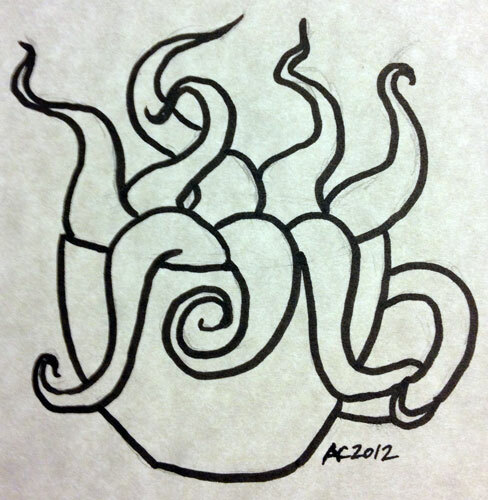 Today there’s a little doodle from someone’s Cthulhu Coloring Book. Will that be one tentacle or two? Monday we visited tiny Tolkein fandom with Storm, while Tuesday the tentacles got all steampunk with the golden Tentacle Idol. 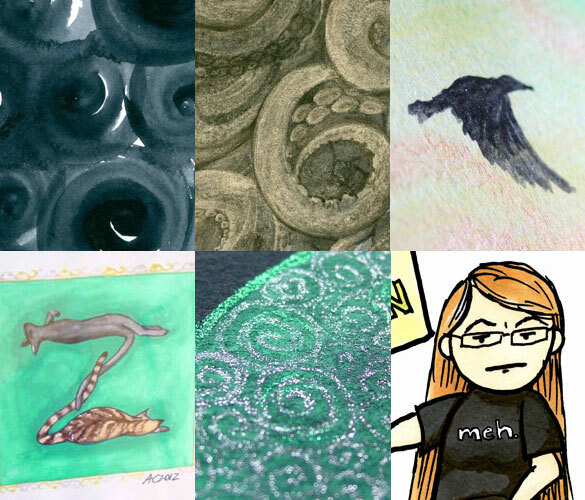 Wordless Wednesday revisited crows, and on Thursday I finally finished my alphabet with Z is for Zoomorphic. 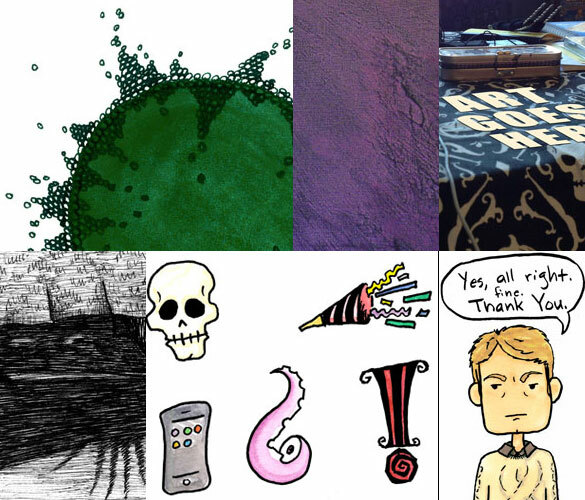 Then, Friday we saw the third Filigree Moon painting, and Saturday I expressed my feelings about pollen in cartoon form. 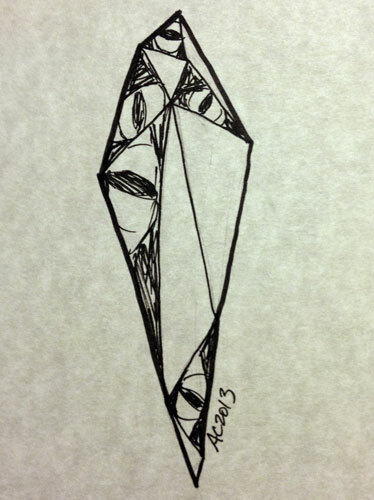 For Sunday’s sketch, I have another little doodle from someone’s Cthulhu Coloring Book, a mysterious crystal with eyes staring out from its facets. Sorry about the SAN loss. Tomorrow begins Bookmark Week! 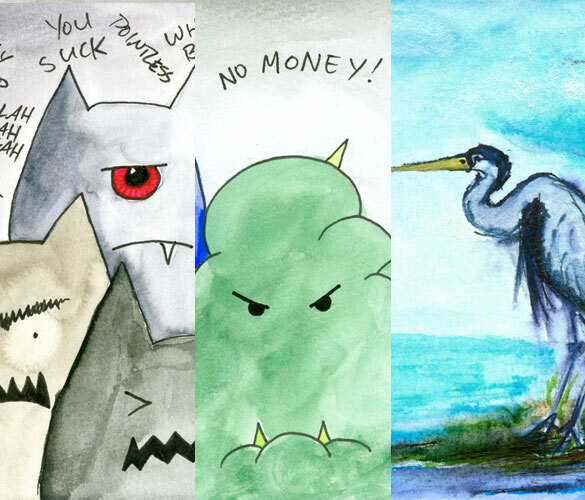 My newsletter list got a little preview so a couple of them are already sold, but there’s still a bunch left for you to covet. I’m not sure I’d want this hung on my anything — tree, house, ankle… It looks unpleasantly gooey and bitey. Very bitey. The holiday season meant coloring books, of course, and I even had time to sketch in most of them! 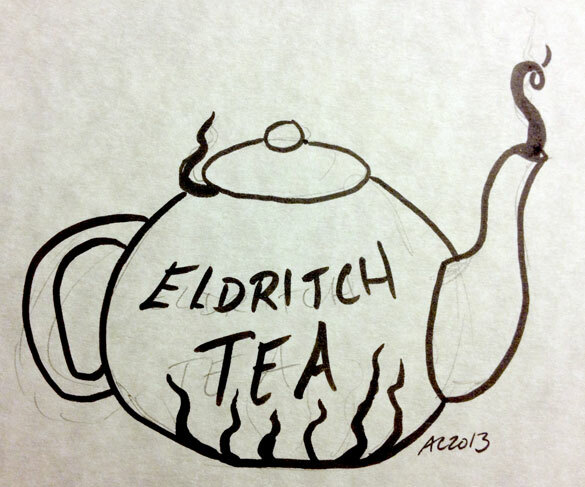 This little cuppa’s got something a bit stronger in it than tea, eek. 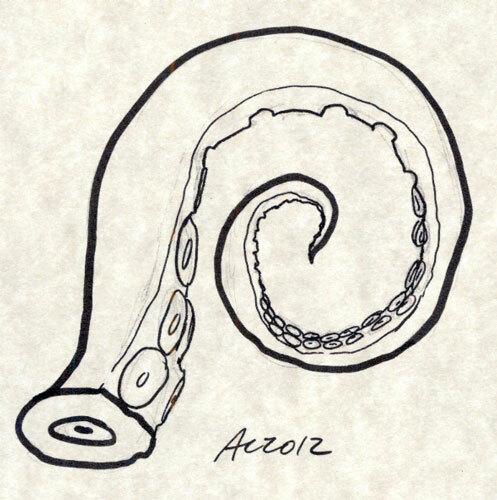 I owe a somewhat patient friend of mine a tentacle or two, and I was thinking about that when I doodled this in someone’s coloring book. It’s the end of the year, a good time to wrap up things you owe people, after all.